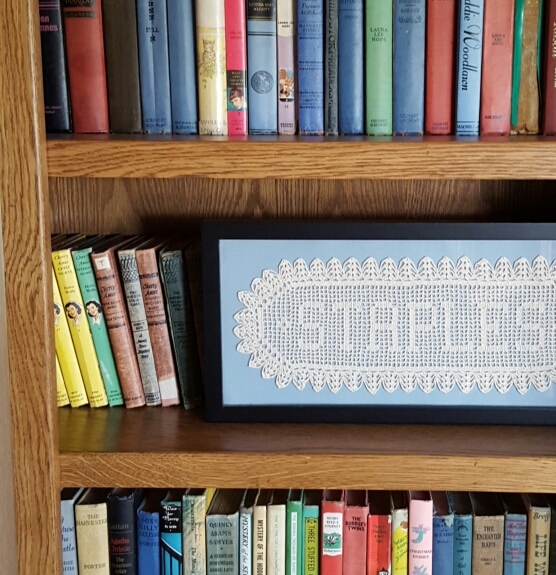 This doily was a wedding present from a family friend who passed away this year. There were so many good things this year. 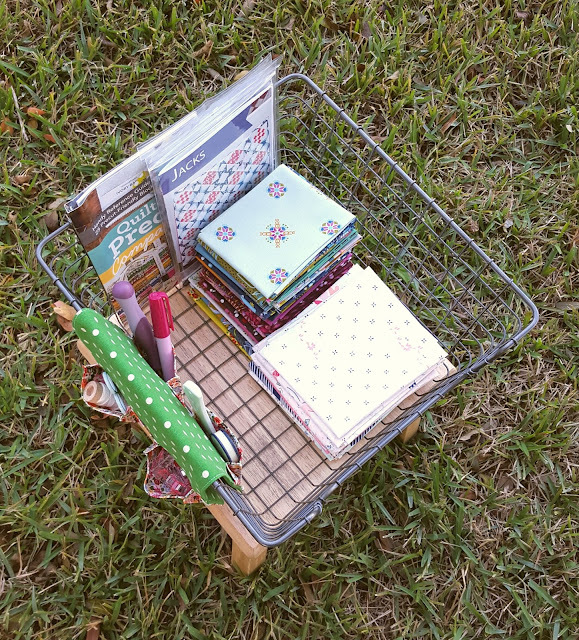 My book, Sew Organized for the Busy Girl, was released. 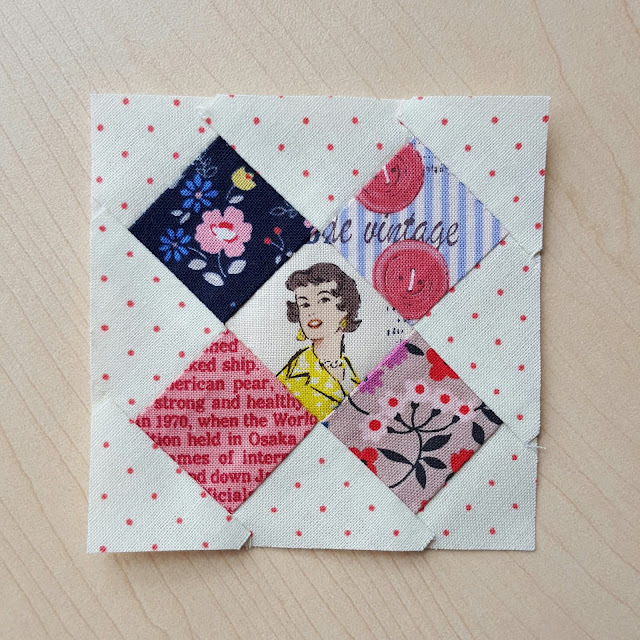 I attended my first Quilt Market. I packed up 37 years worth of memories and moved to the Texas hill country with my family. Yet in many ways, this has felt like a year of being taken apart and put back together again. I'm starting over on so many things. Where do I go from here? Where do I want to go? The truth about change is that it's hard -- even when the changes are good. When you've done things one way for so long, it's hard to imagine doing anything else. The good news is that every one of these changes has led me to this moment in my life where I can truly say that I'm content. I get to do what I love in a home that I love with the people I love. And though I honestly don't have a clue where I'm going in 2016, it's okay. I'm taking things one day at a time. Change isn't easy, but it's better than a lifetime of fear. I would rather go forward than stand still or, worse yet, slip backwards. So friends, may you and I lift the sail and go with joy to whatever God has in store for us in 2016. 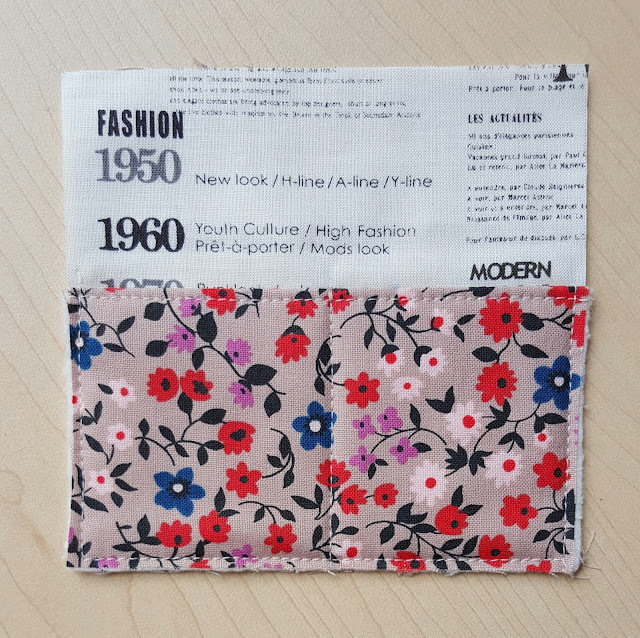 It all started with a charm pack of Carkai by Carolyn Friedlander for Robert Kaufman Fabrics. I saw that gorgeous spectrum of color spread across my cutting table, and then my eyes drifted to a wooden spool of Aurifil floss in the tool cart nearby. 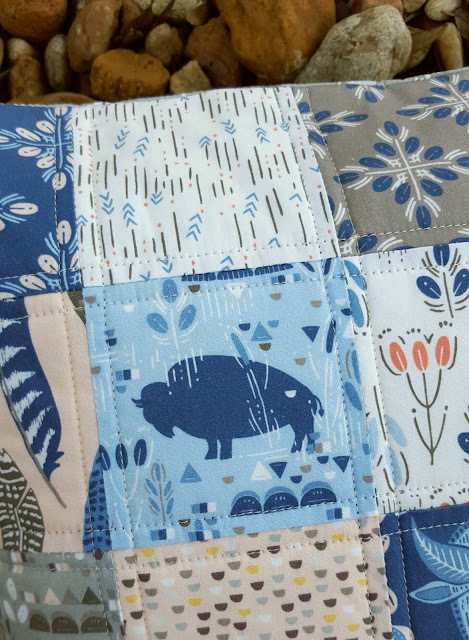 And suddenly I knew I had to make this quilt. This is by far the most "modern" project I've attempted in quite a while. I modeled my spools completely on the tall, thin Aurifloss wooden version -- these are exactly twice the size of the original -- using about half of the Carkai charm pack for my "thread" colors. I couldn't resist adding an empty spool in there for fun. 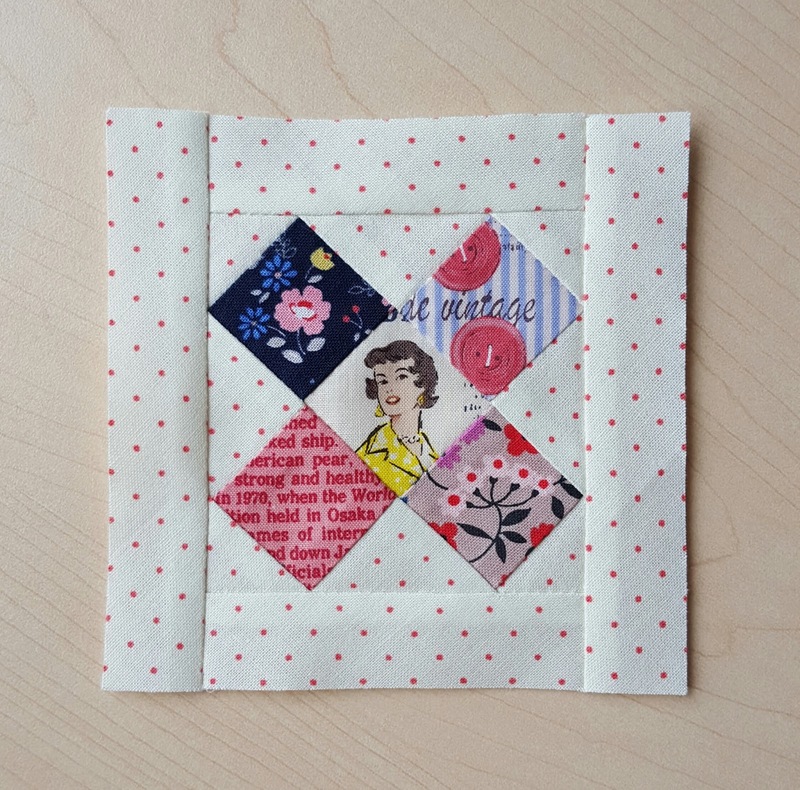 I used Quilter's Linen for the spool ends and an off-white shade of Kona solid for most of the background, tossing in some of the low volume prints from Carkai for more depth and interest. I love how one of the Carkai prints next to the brown spool had a line of the same color in it, so that it looks like a bit of thread is coming off that spool. 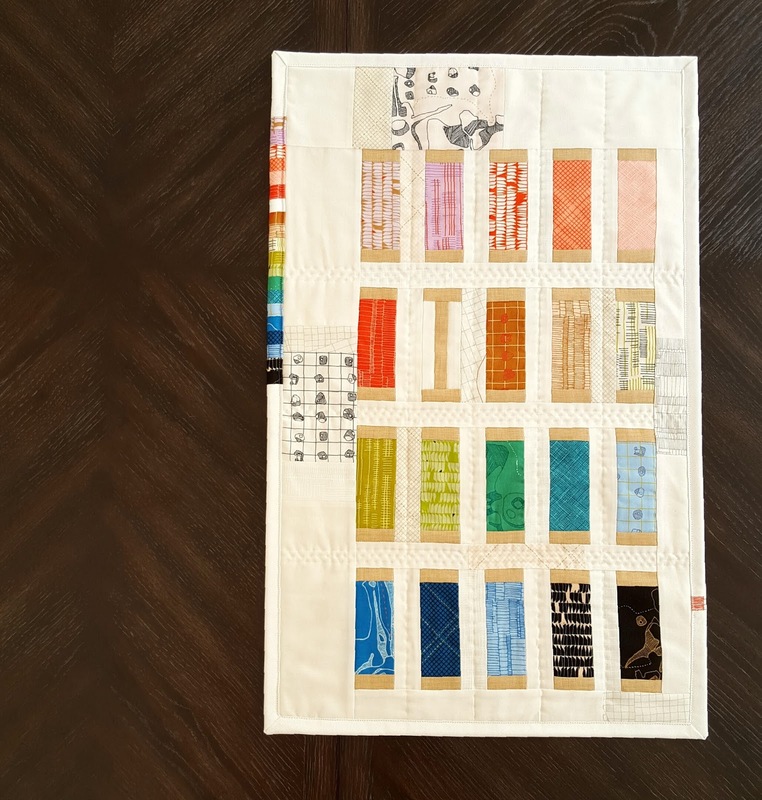 Of course, I had to quilt this one by hand using creamy white Aurifloss, adding three rows of stitches between each horizontal row and one between every vertical row of spools. It was a joy to sit by the window at the end of our loft and sew by hand on this little quilt all afternoon. 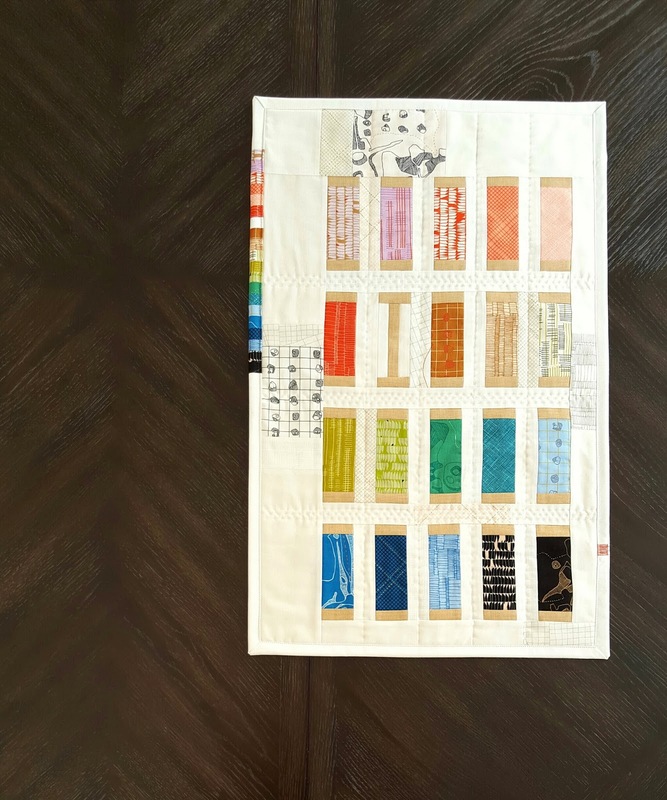 For my binding, I used a white crosshatch print from Architextures and included a spectrum of all the "thread" colors along the top left side of the quilt, leaving a gap for the empty spool. 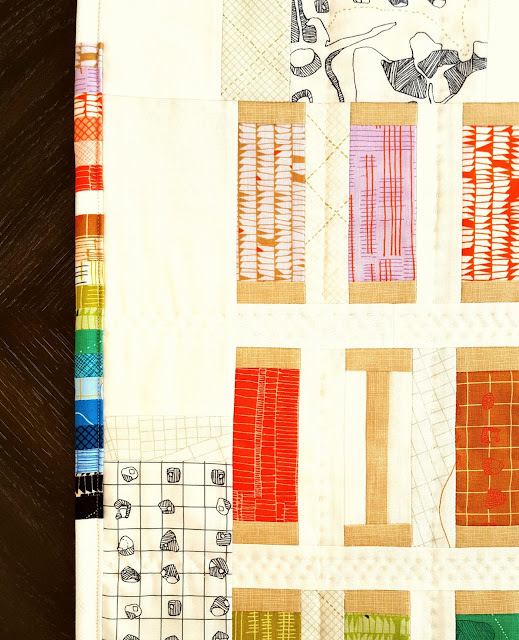 If you look closely, you'll see that missing "thread" color on the bottom right side of the quilt binding. This was one of those project ideas that hits you like lightening out of the blue. It's the kind that you just suddenly have to make -- and can't stop working on during every free moment you have until it's finished. And when you're done, you step back and look at it and it just seems like a gift that caught you by surprise, that was sent to you when you had no idea it was coming. But you're so glad it did. Back when I first developed the Double-Zip Clutch for my book, Sew Organized for the Busy Girl, I remember thinking, "Someday I need to try making a miniature one of these." Well, today was the day...and wow, do I love it. For those of you who might want to try one of these, I simply cut all the measurements in half. This smaller version finishes at 4 1/4 x 5 1/2" closed, 5 1/2 x 8 1/2" open. I also switched out fusible interfacing for cotton batting which I attached with adhesive basting spray. I found that I didn't need to even use the batting to reinforce the lining on the end zipper pockets; the smaller version holds up quite nicely without it. 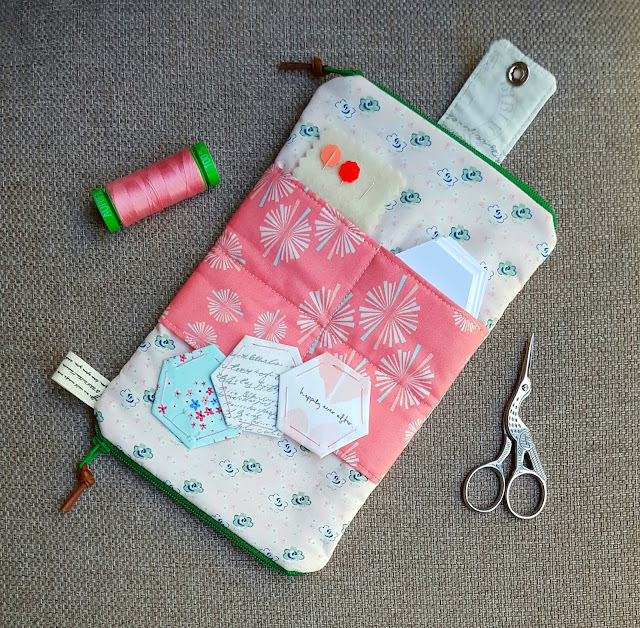 This clutch couldn't be a more perfect size to use as an English paper piecing kit for basting hexagons. All the fabrics you see here are from Amy Sinbaldi's charming new collection Paperie for Art Gallery Fabrics, which features plenty of delicate small scale prints as well as a vintage book theme -- two of my very favorite things. 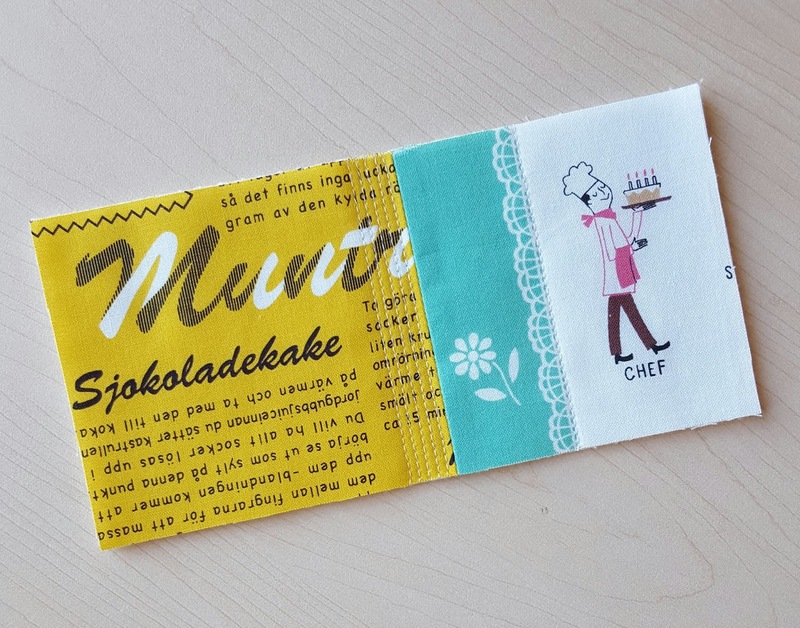 These sweet prints will definitely be showing up in future projects. This was my first time trying metal snaps as a closure, and I'm definitely a fan. I also added leather zipper pulls and trimmed it with a bit of twill tape covered in French handwriting as a final touch. There are pockets here for everything: paper pieces, basted shapes, needles, thread, scissors, and fabric. 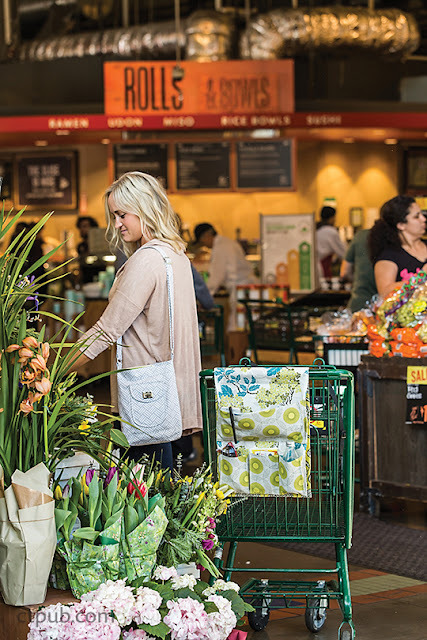 It all zips and folds up into an easily hand held package. 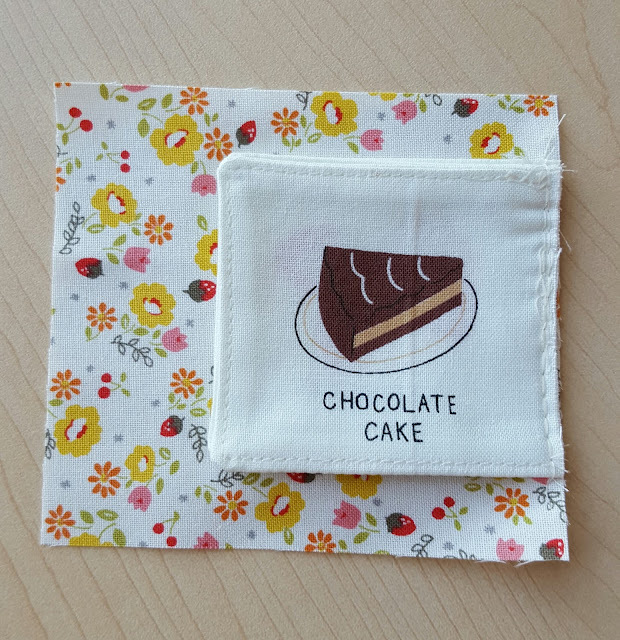 Best of all, it only took me a few hours this afternoon to sew this up between helping the girls with their classes. It's no secret to all of you that I like to keep things organized in my sewing space. 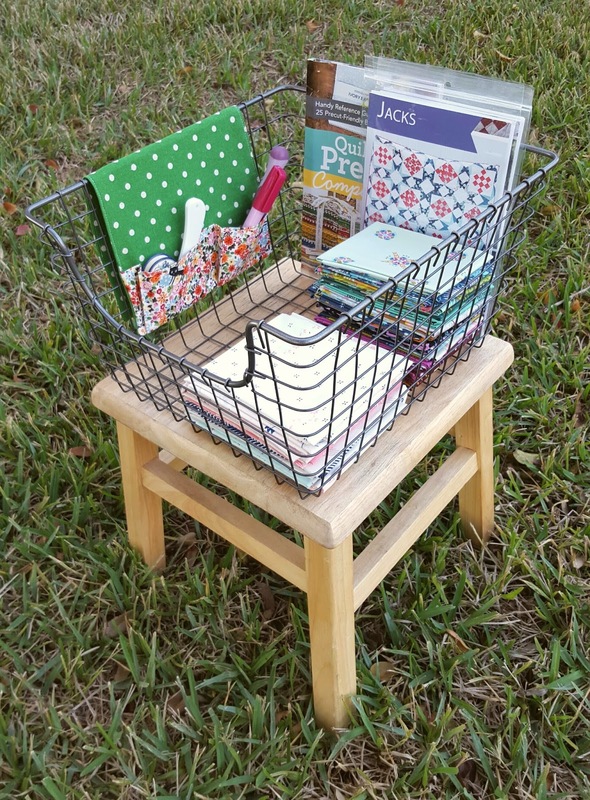 And when my friend Lindsay Conner asked if I'd be a part of the blog tour for her new book On-the-Go Bags (co-written by Janelle MacKay), I was excited to find organizational inspiration in those pages. Not only is it full of bags for every use and occasion, but there are also projects that can help you keep your sewing projects organized. After lots of indecision on what to sew, I finally adapted the Cart or Stroller Caddy pattern by Veronica Lovvorn to make the miniature Bin Caddy above. Mine isn't exactly the same as the original, but very close, and I absolutely love the way it turned out! 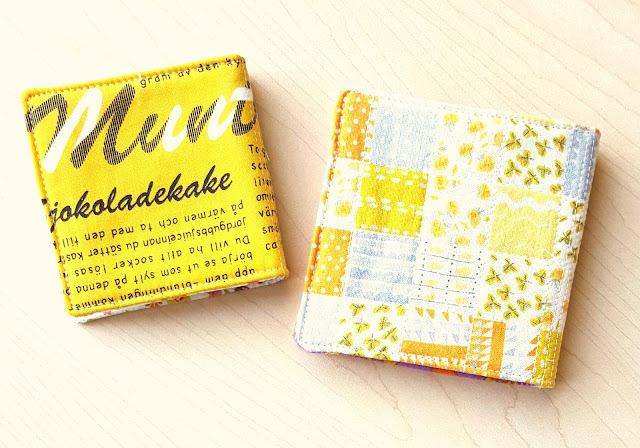 Veronica gives you both small and large size options for this project, but I made the pattern even smaller (mine finishes at 7.5 x 12.5") so that it could neatly drape over the side of a wire basket that sits at the right hand side of my sewing machine. 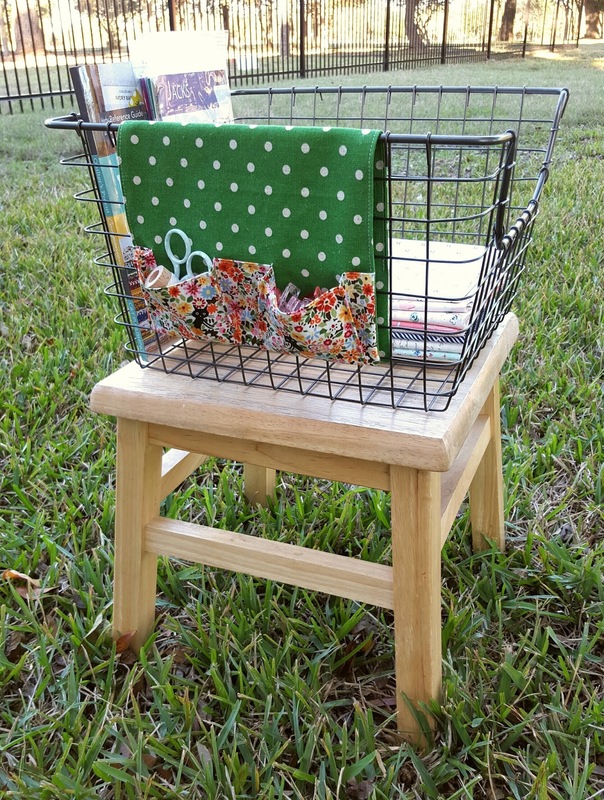 This basket is where I keep new patterns and fabric that I hope to use on upcoming projects -- sort of like a window display for my newest sewing toys! 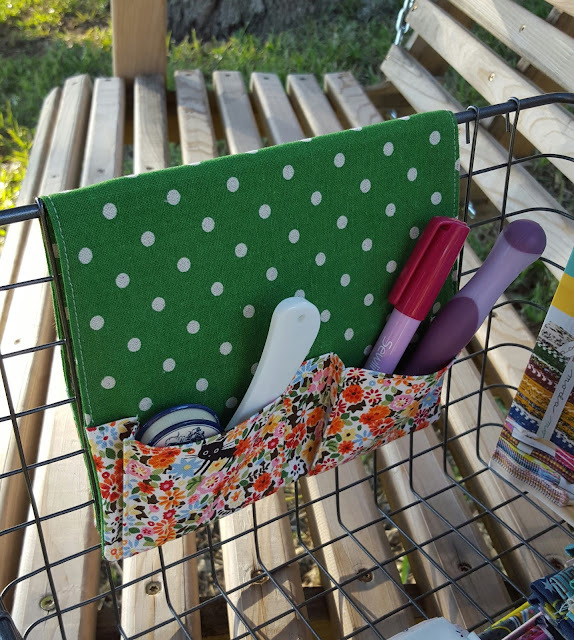 -- and it makes the perfect place to hang this little organizer, keeping small tools within reach when I need them. 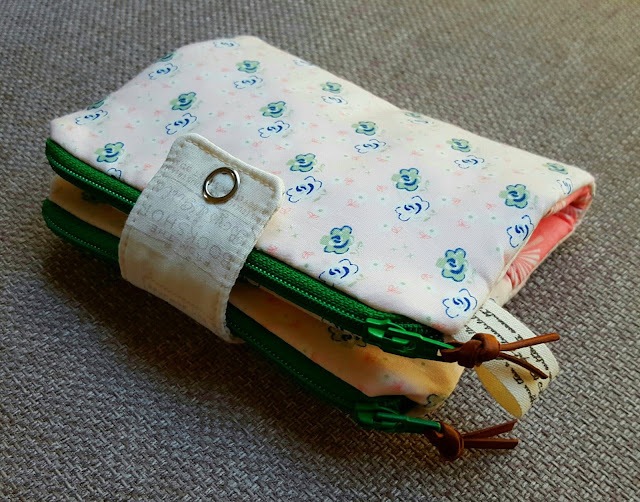 The original pattern adds a strip of velcro so that you can fasten this caddy to a cart or stroller handle, a wonderful addition for those versions but not necessary for mine. 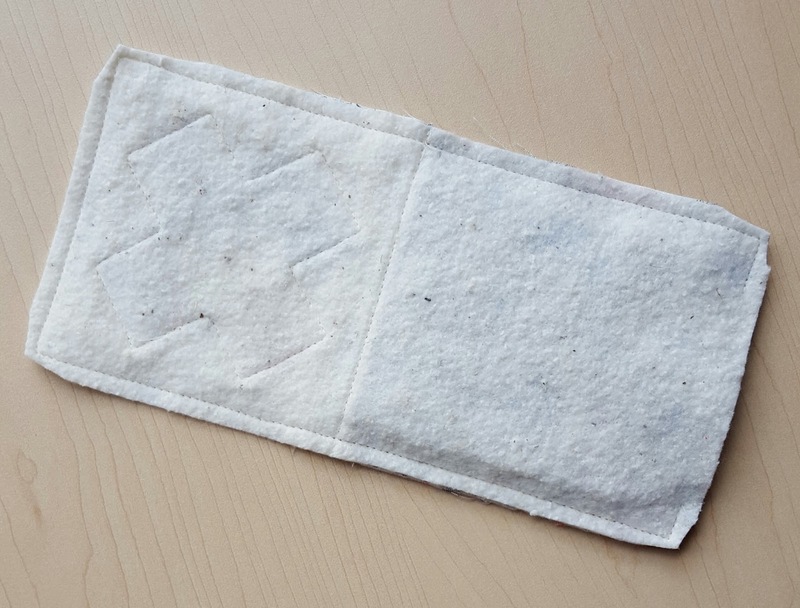 In fact, the linen that I used gave it enough weight that I didn't even need to use interfacing. I can't tell you how much I love it! Be sure to check out this book trailer for On-the-Go Bags where you can get a peek at all the cute projects inside. Above is the original large caddy from the book, but there are plenty more fantastic patterns in there. You can also purchase your own copy right here. And yes, we have a giveaway! Leave a comment below before December 15th, and you'll be entered to win a copy of your own. U.S. winners will receive a hard copy; international winners outside the U.S. will get an e-book. Good luck! My little Mouse has been absolutely fascinated by the stack of Pocket Mending Books that's been growing on my sewing table. She begs to look through them every day as soon as she finishes her kindergarten classes, wanting to pore over them by herself -- and then again on the pretext of showing them to her stuffed dog Snuffy. 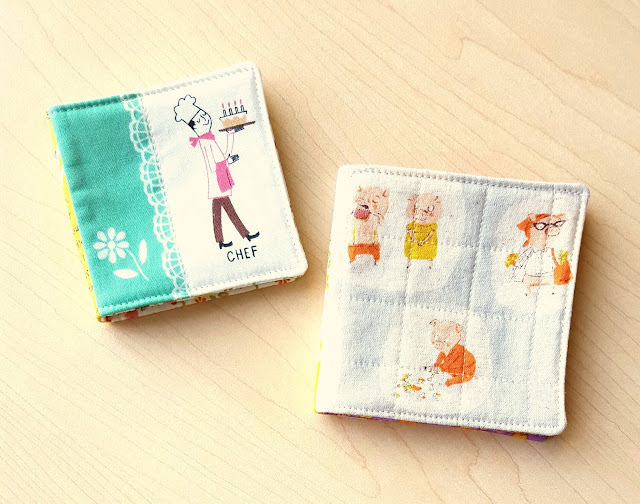 Since it's been tricky to empty the needles and scissors out of the books each time she wants to see them, my husband suggested that I make a special kid-friendly version that the girls can enjoy without any worries of pricked fingers. 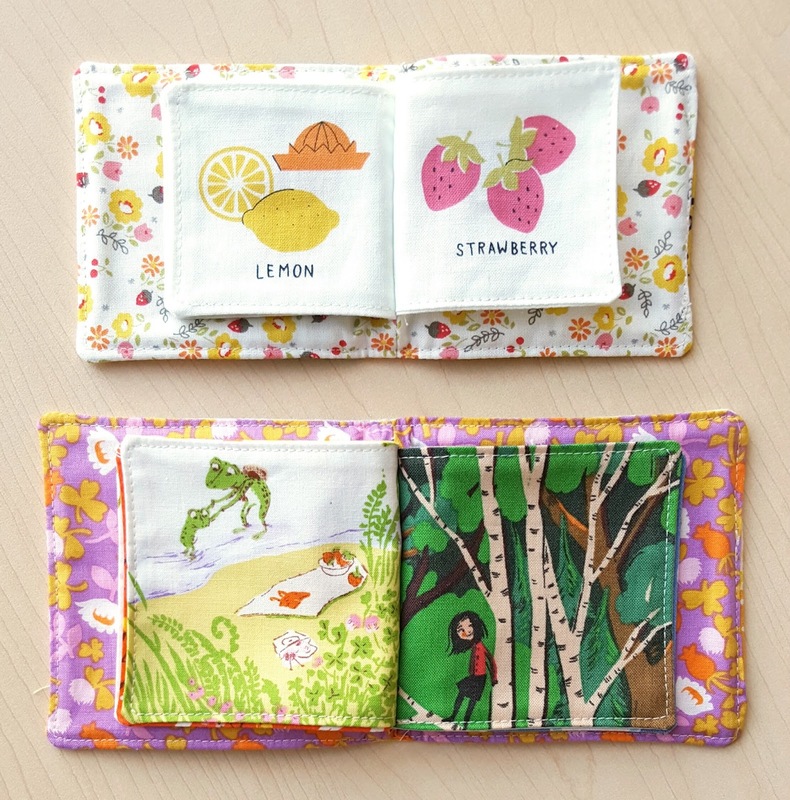 These books are actually pretty nifty gifts for the little people in your life. 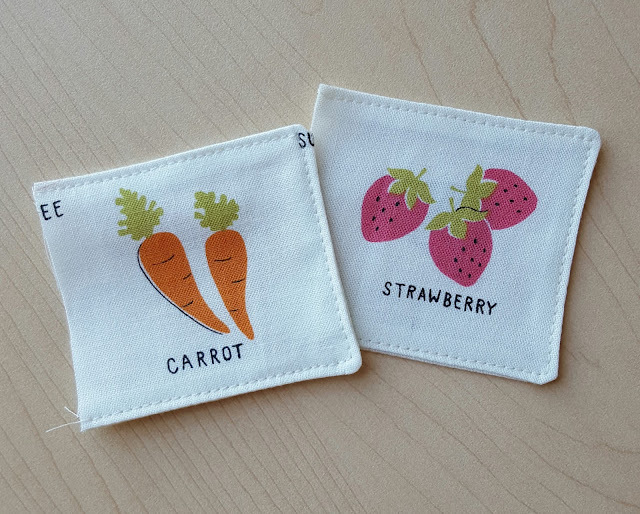 Not only are they small and soft, but they can teach colors, letters, animals, etc. My girls are already planning to use these books when they're playing school or restaurant with their dolls. I've included two sizes -- one the same as my Pocket Mending Book and the other a little smaller. This is such a fun project for scraps, and it's also perfect for making with your kids. Mouse helped me with some of the sewing on the smaller version. 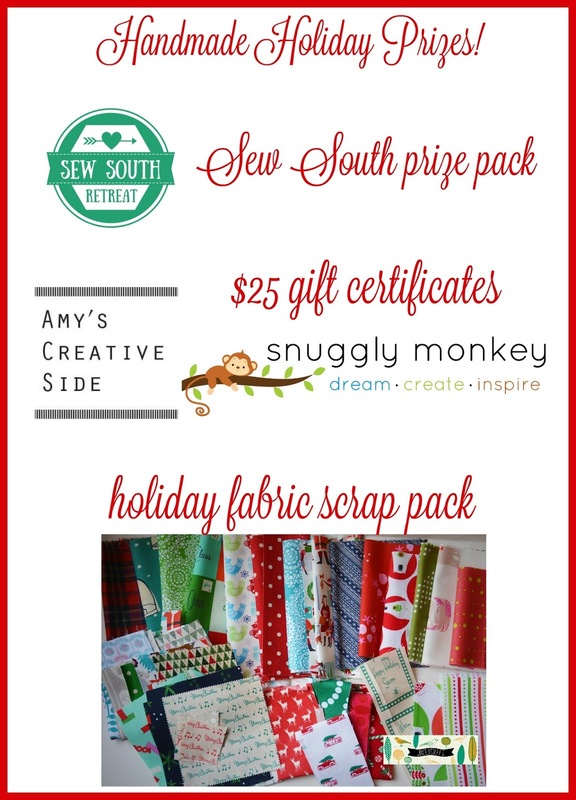 It's also a great last minute present, easily sewn up in an hour. Keep in mind that the more pages you include, the trickier it is to sew (especially on the smaller version). I wouldn't try to fit more than 4 pages in here, but if you're brave enough to add more, go for it! So here's a tutorial for you, my friends. 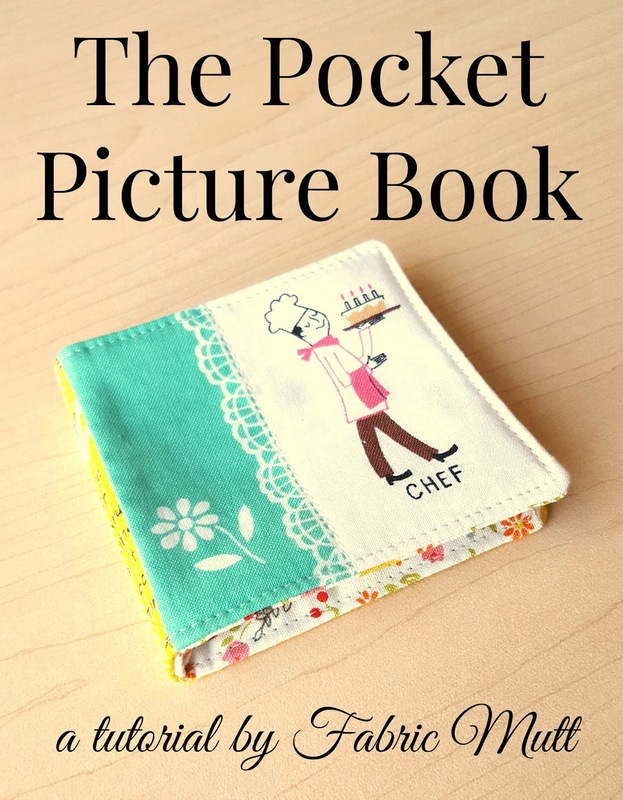 If you make one, please share it on Instagram with me @fabricmutt, and be sure to tag it #pocketpicturebook. *All seams 1/4" unless otherwise noted. 1. 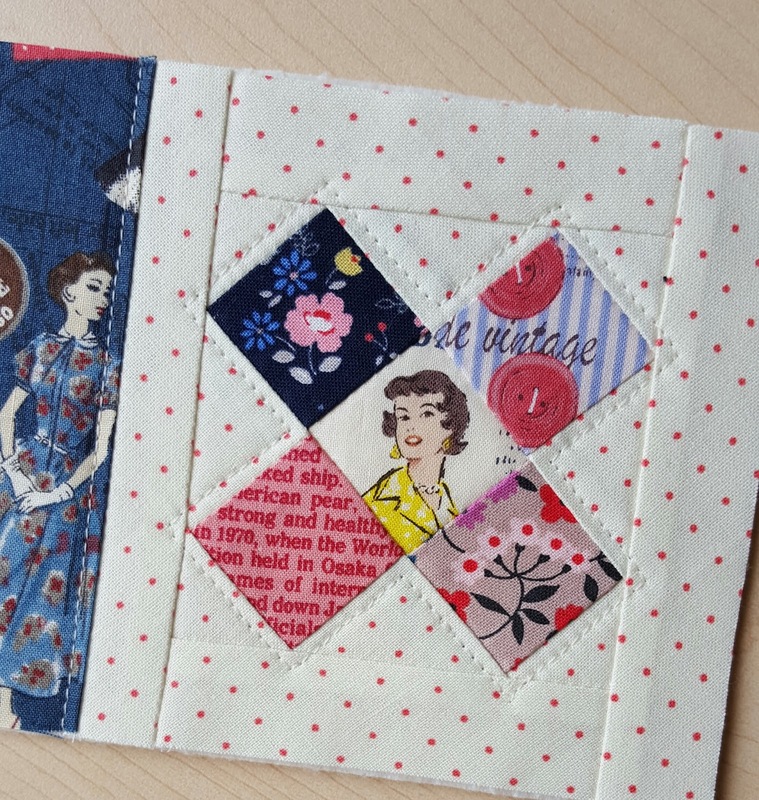 Sew the left side of the front cover to the right short side of the back cover. 2. Attach the wrong side of the fabric to the batting with adhesive basting spray and quilt as desired. 1. 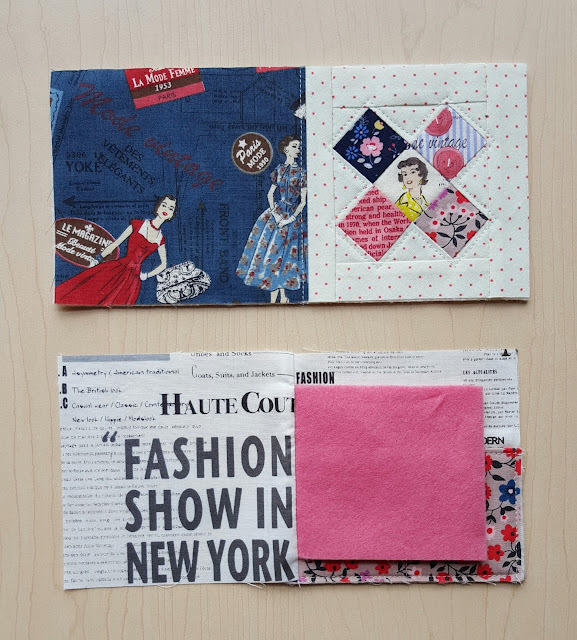 Decide what order you want your pages to be in, and then pair up your pages with the right sides of the fabric together. 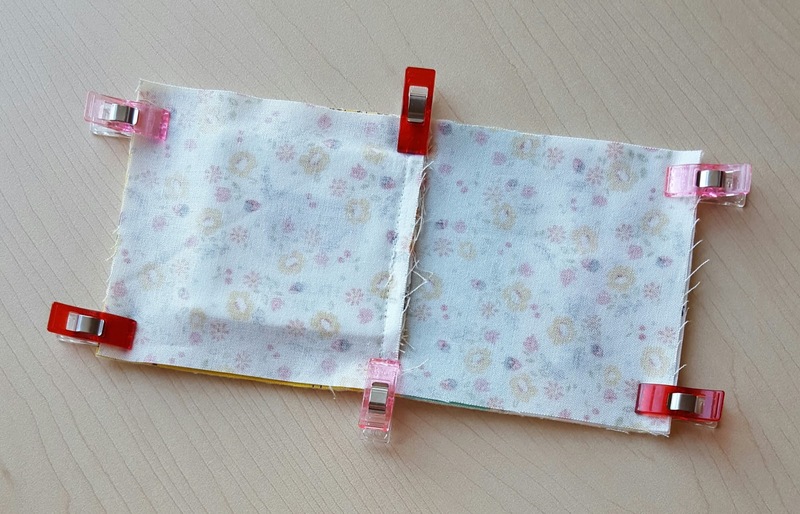 Sew around the top, side, and bottom of the page, leaving one side open. 2. Turn the page right side out, poking out the corners with a turning tool, and press. Stitch 1/8" all the way around the sewn sides, still leaving that last side open. 3. Stack the pages together in the order you want them and baste them together along the open sides, 1/8" from the edge. Sew from the center to the top and then from the center to the bottom of the stack to keep the pages from moving around too much. 4. Place your stack of pages (front down) on top of the front lining piece, so that the basted edge lines up with the right edge of the piece and baste it in place 1/8" from the edge, again sewing from the middle to the top and then bottom. 5. 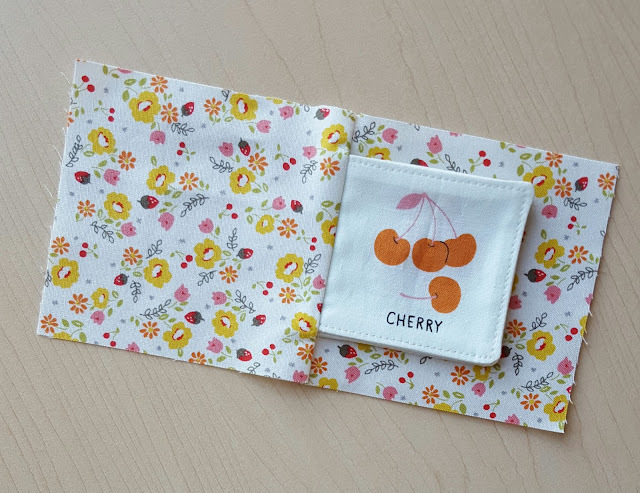 Stack the front and back lining pieces on top of each other with the pages sandwiched between them, checking to make sure that when you open them, they'll be in the correct positions, and stitch 1/4" from the same side where you basted the pages in place. Press the lining open. 1. Pin or clip the exterior and lining on top of each other, right sides together. 2. Sew 1/4" all the way around the outside of the rectangle, backstitching at the start and finish. Leave an opening of about 2 1/2" on the short end next to the back exterior piece. Trim the corners without cutting through the stitching. 3. Carefully turn the book right side out through the opening on the short end, using a turning tool to push the corners out, and give the book a good pressing with your iron. Tuck the edges back inside the opening, and topstitch 1/8" from the edge all the way around the outside of the book. Be sure not to catch the pages in your stitching. 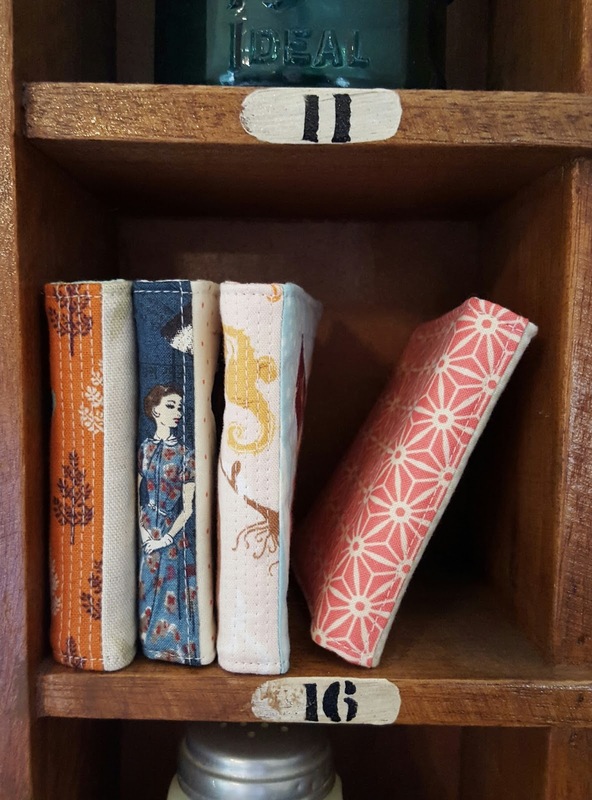 Close the book and press carefully around the binding to help your book stay closed properly. 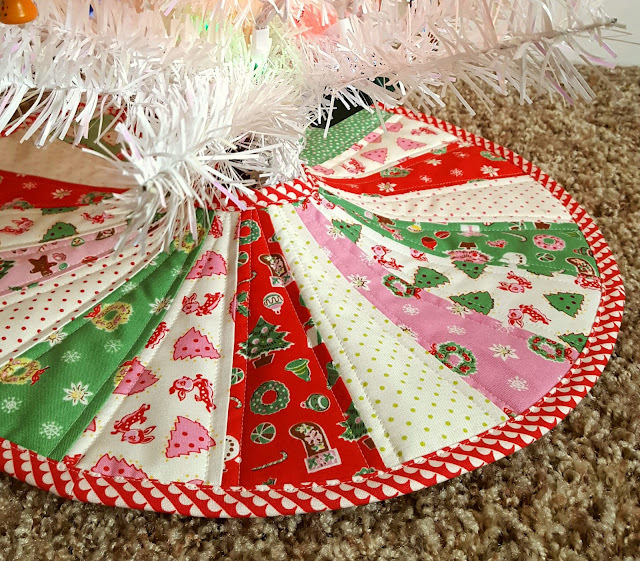 Today I'm guest posting over at Ellison Lane for Jennifer's fabulous Handmade Holidays series. 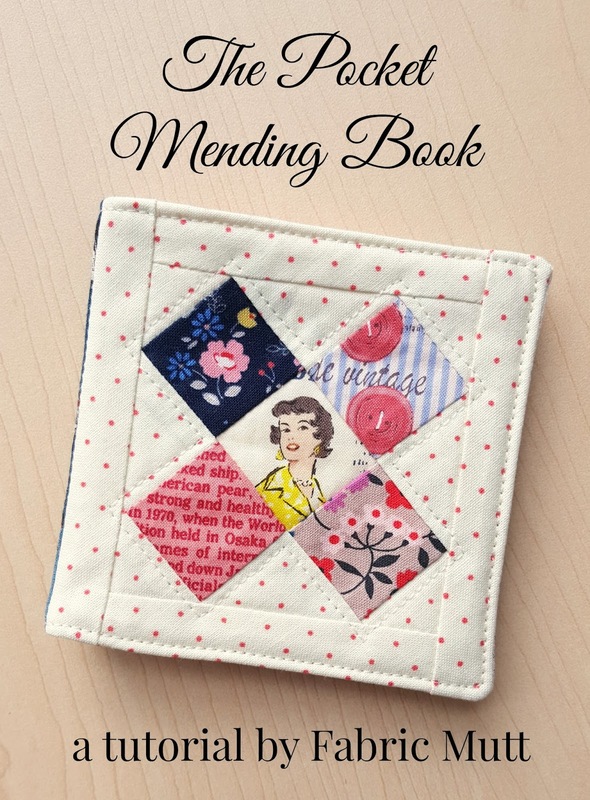 I'm sharing more versions of my new Pocket Mending Book Tutorial as well as three of my favorite online recipes for the holiday season. Take a peek at the fabulous December giveaway she's hosting too. Yep, lots of good stuff going on here. Click on over to check it out! My friends at Hawthorne Threads invited me to be a part of their latest blog hop this week, and I was able to whip up a fun little pillow with the fabric they sent me from their new Roam collection. 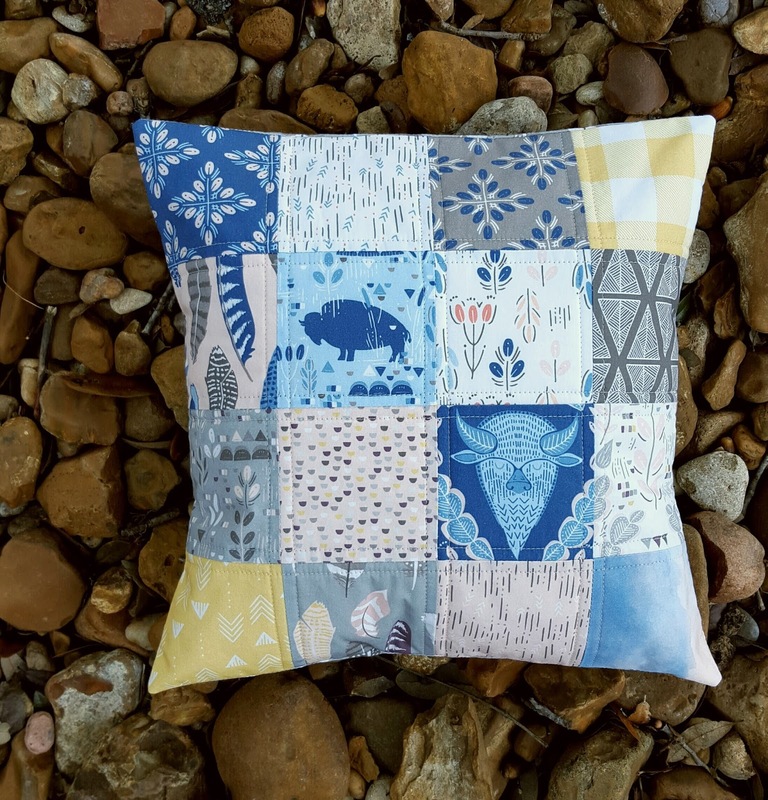 Featuring wandering buffalo, prairie landscapes, and a fairly neutral color scheme, somehow these prints manage to be rustic and playful at the same time. 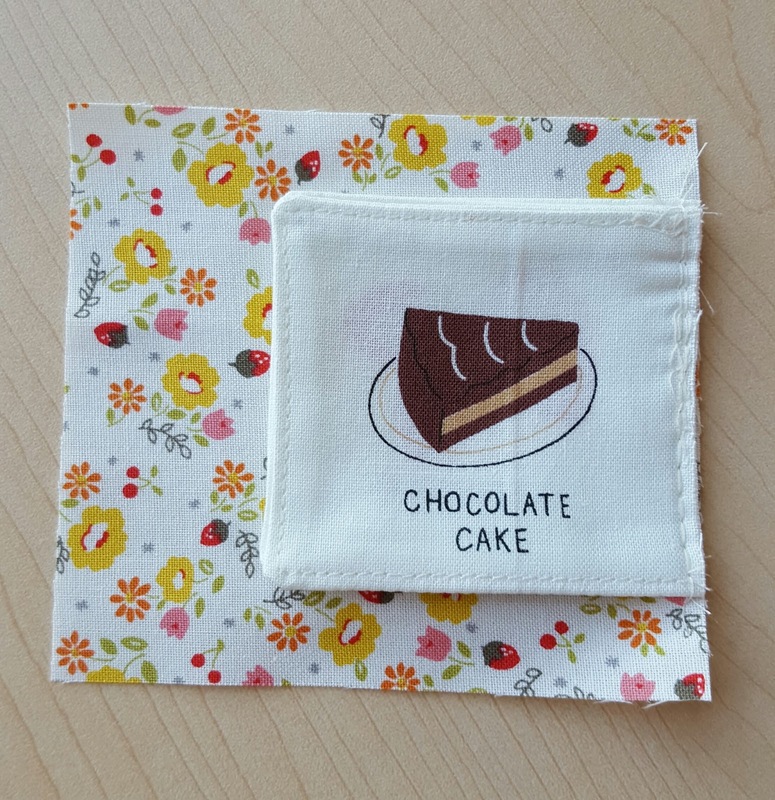 I made this 12 x 12" pillow cover using small fussy cut pieces of fabric that finish at 3" square. 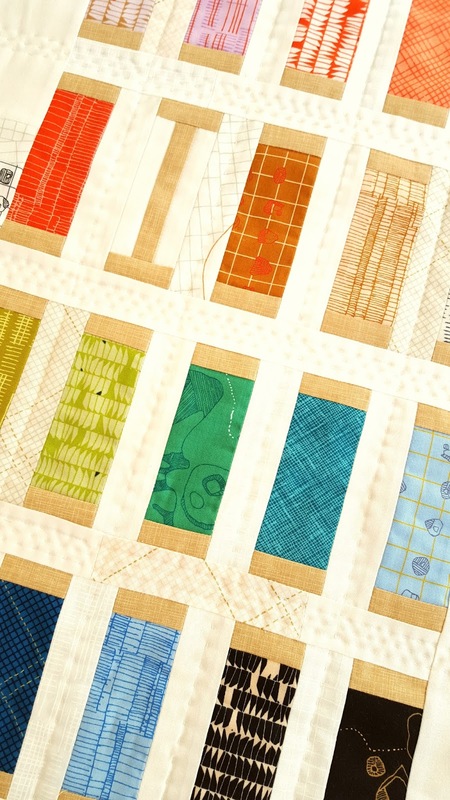 Quilting lines are 1/4" on either side of all seams. 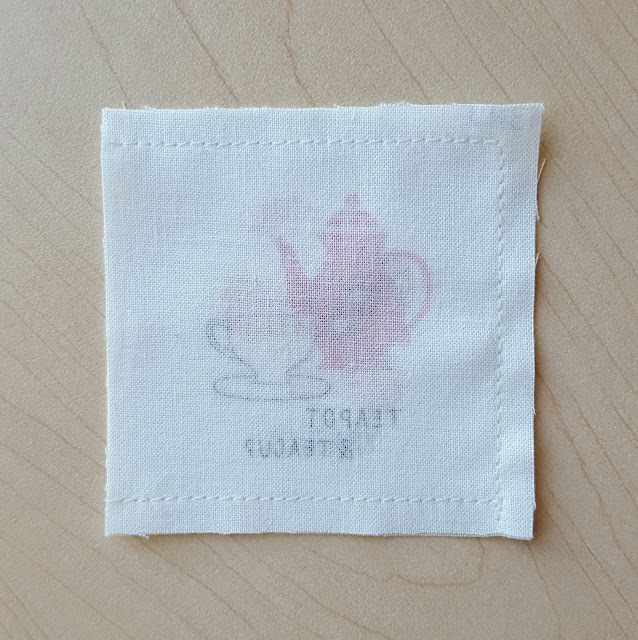 It's a very simple pattern, but one of my favorites. There's no better way to let the prints speak for themselves. 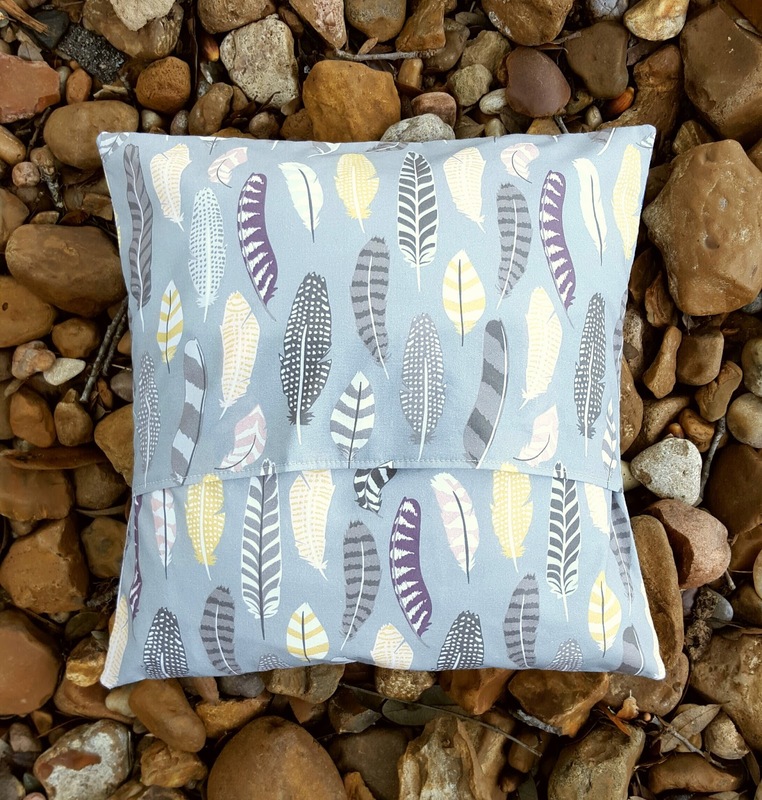 The pillow backing is Feather Collective in Sage. I really like the details in this print, and that impression of falling feathers has a great sense of movement. If you'd like some fabric to play with yourself, just leave a comment -- any comment -- at the bottom of this post. International entries are welcome. 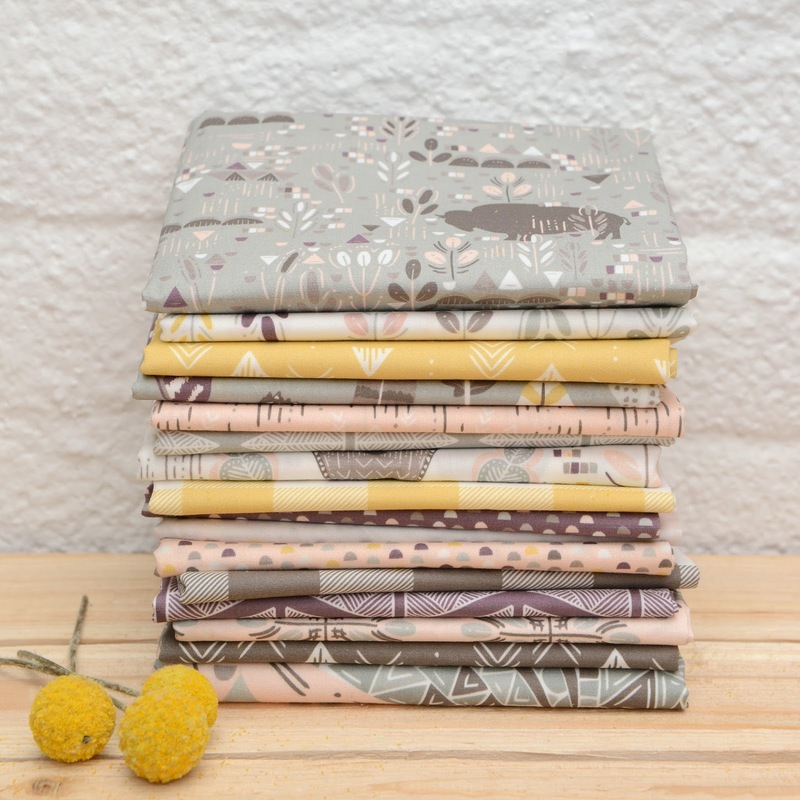 Hawthorne Threads will be giving away a fat quarter bundle of Roam in the dusk colorway to one lucky winner! 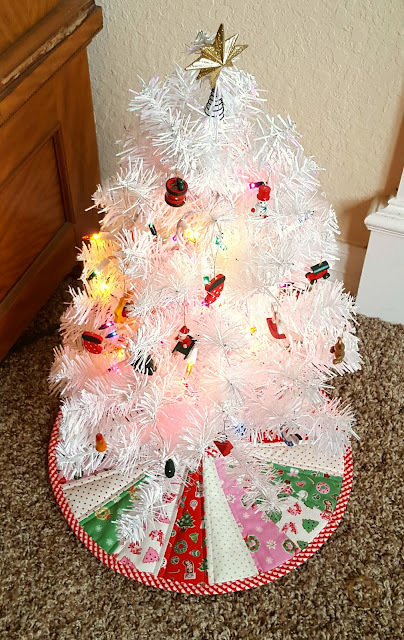 Every year in our home, we have the tradition of the Children's Christmas Tree. This little white tree, which belonged to my grandmother before she passed away, is decorated with colored lights and tiny wooden ornaments by my girls -- no grown-up help allowed. It's the one job that is especially their own, and they can hardly wait for the Thanksgiving leftovers to hit the fridge so that the Christmas decorating can officially begin. 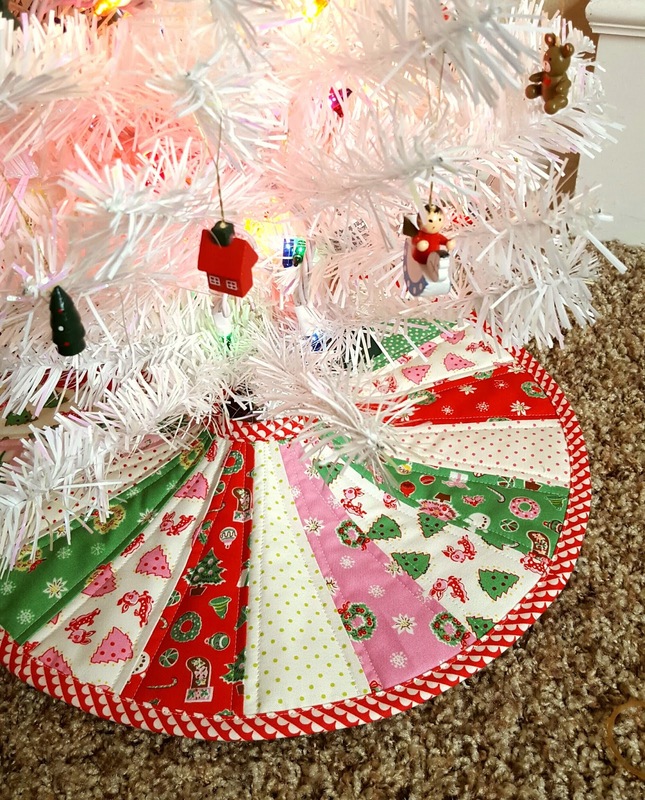 In the past I've used a scarf as a last minute tree skirt, but this year I knew it was time to make something more permanent. I pulled out the rest of my Little Joys bundle by Elea Lutz for Penny Rose Fabrics, added a few La Creme Dots from Riley Blake Fabrics, and used a red and white scallop print by Bonnie and Camille for the binding. The wedge shapes were cut using a dresden ruler that I've had for ages, sewn together with a 1/2" seam between wedges. I was completely winging it with this project, and though I've had my share of sewing disasters while improvising, I'm happy to say that this one was a complete success. It reminds me again why I love to sew. What a joy it is to make something with your own hands, and to make it exactly the way you've imagined it to be. What a pleasure to share that handwork with the people you love, to see their eyes light up over the something special you made for them. But then to know that it will become a part of your family's legacy, that your children will take it out of storage someday and show it to their children and say, "When I was a little girl, your grandmother made this for us. This is part of our family. This is how we celebrate Christmas." I can't think of anything better than that. I'll be sharing more versions of this project in a guest blog post next week for Handmade Holidays at Ellison Lane Quilts. For now, though, here's everything you need to start making one of your own. If you share these on Instagram, please tag them #pocketmendingbook and tag me @fabricmutt too. 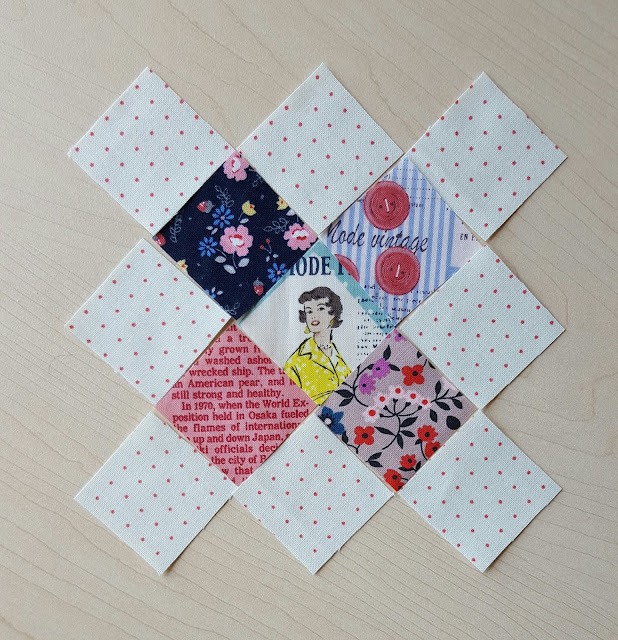 *Shortcut Option: Substitute 1 square (4 3/8 x 4 3/8") for the first two fabrics in the supply list to make a quicker, easier project. Note: All seams 1/4" unless otherwise stated. 1. 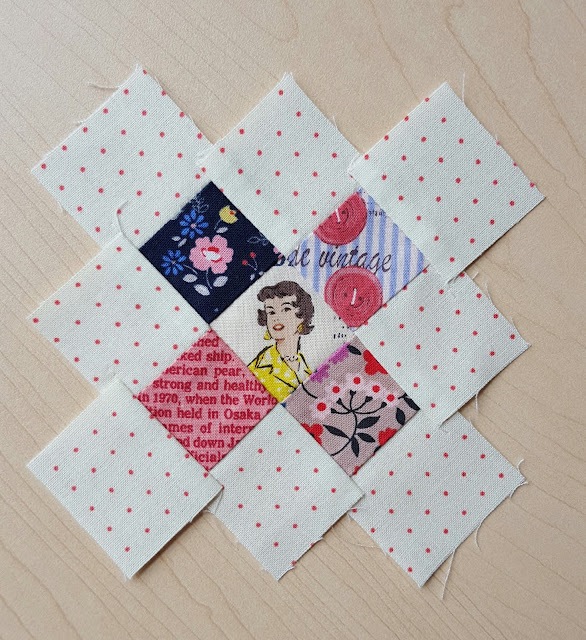 Arrange your feature squares to form the X in the center of the cover block, placing the white background squares around them. 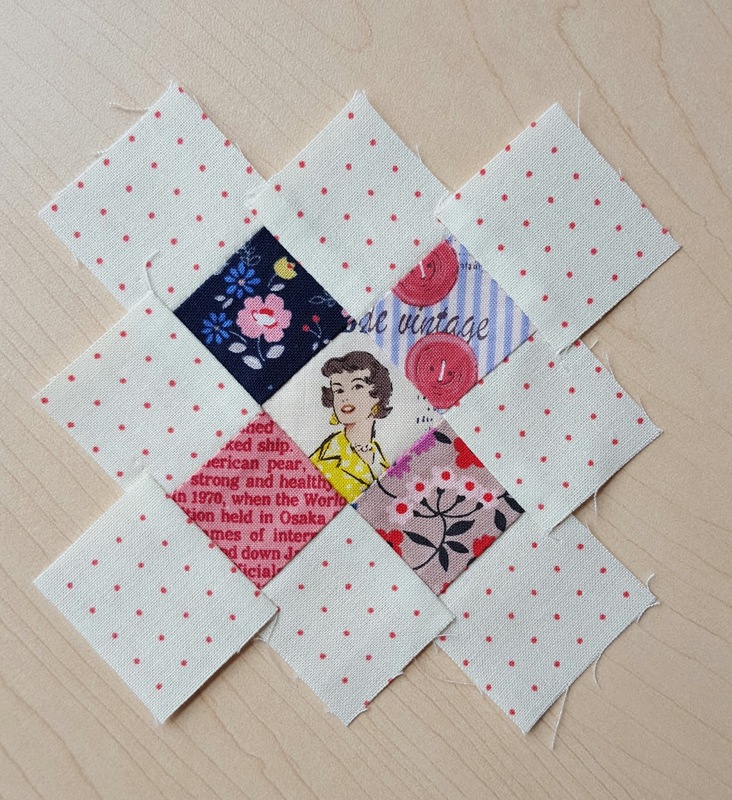 Sew the squares together in rows. Trim the block so that it measures 3 3/8" square. 2. 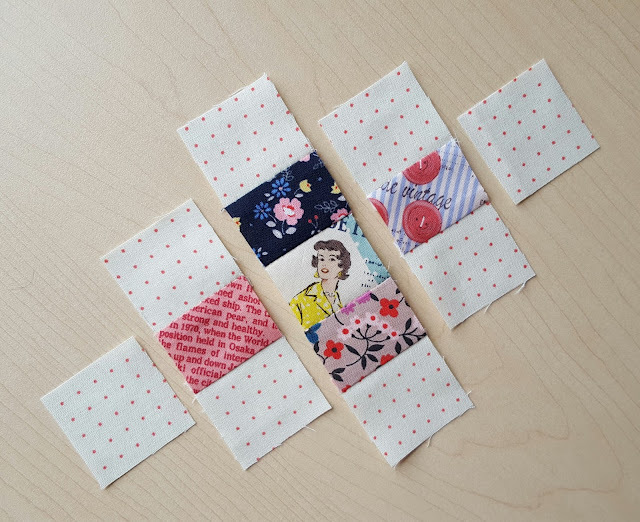 Sew the 1 x 3 3/8" background strips to the top and bottom of the X block, and then sew the remaining background strips to the right and left sides of the block. 3. Sew the left side of the cover to a 4 3/8" side of the blue exterior back piece. Use adhesive basting spray to fuse the cover to the 4 3/8 x 8 7/8" piece of batting. Quilt the cover as desired and then trim the piece to a rectangle measuring 4 3/8 x 8 3/4". 1. Fold the 4 1/2 x 5" floral rectangle in half, wrong sides of the fabric touching each other, so that the 4 1/2" ends meet. Slip the 2 1/2 x 4 1/2" piece of batting inside the folded piece of fabric and top stitch 1/8" from the fold. 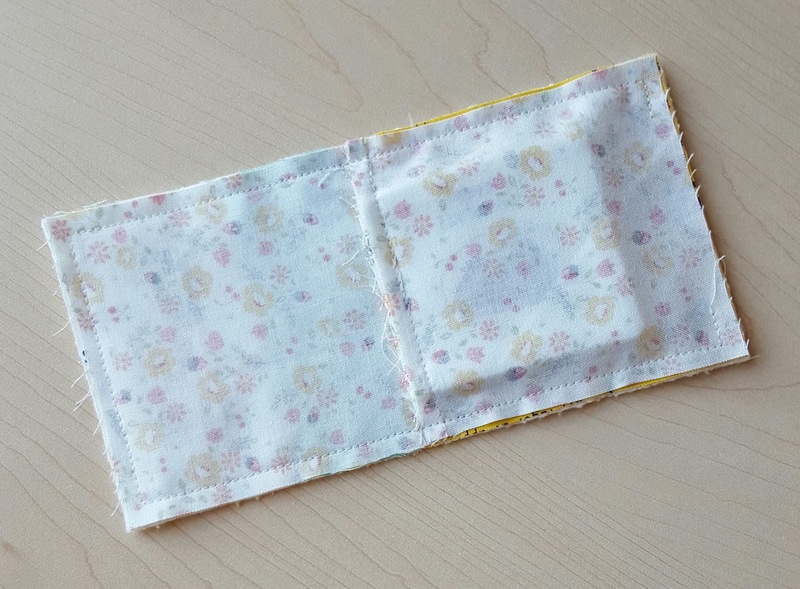 Place the pocket on the back lining piece (4 3/8 x 4 1/2"), aligning it with the bottom and side edges of the fabric, and baste it in place 1/8" from the edge. 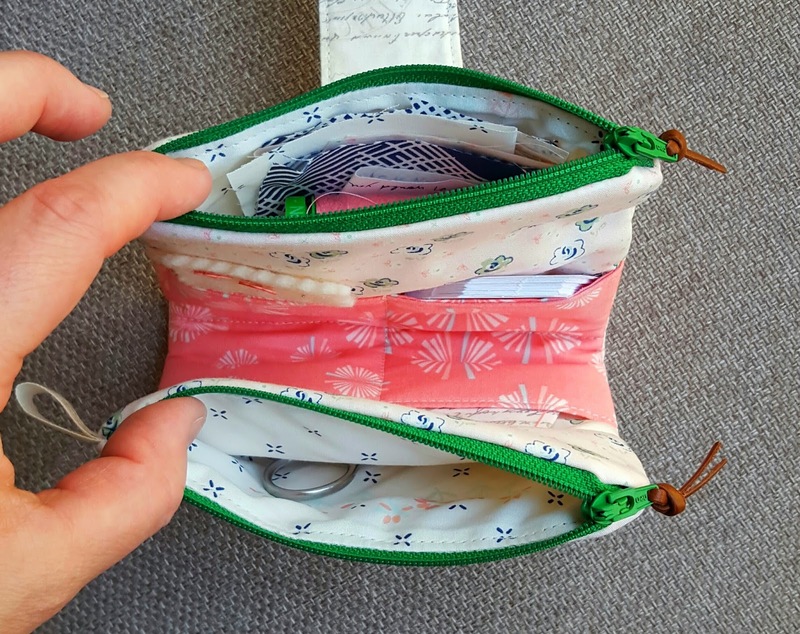 Divide the pocket in two by stitching a line down the middle, backstitching at the top of the pocket. 2. Fold the felt in half so that the short ends meet. Place it on top of the front lining piece (the one with the pocket) so that the fold lines up with the right edge of the piece and baste it in place 1/8" from the edge. 3. 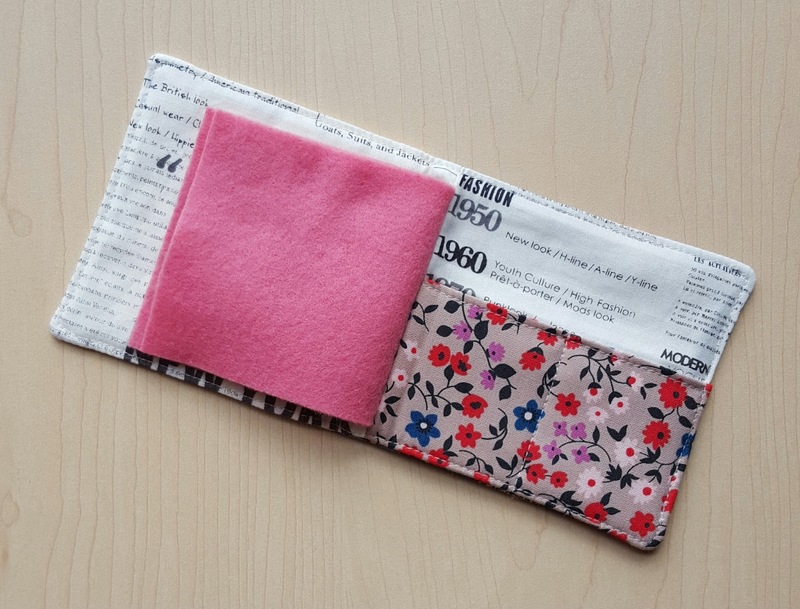 Stack the front and back lining pieces on top of each other with the felt pages sandwiched between them, checking to make sure that when you open them, they'll be in the correct positions, and stitch 1/4" from the same side where you basted the felt pages in place. Press the lining open, being careful not to damage the felt. 2. Sew 1/4" all the way around the outside of the 4 3/8 x 8 3/4" rectangle, backstitching at the start and finish. Leave an opening of about 3 1/2" on the short end next to the back exterior piece. 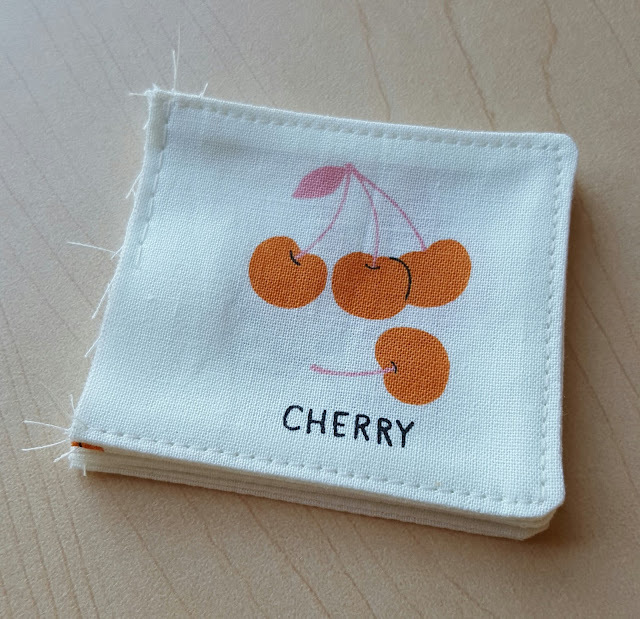 Trim the corners without cutting through the stitching. 3. 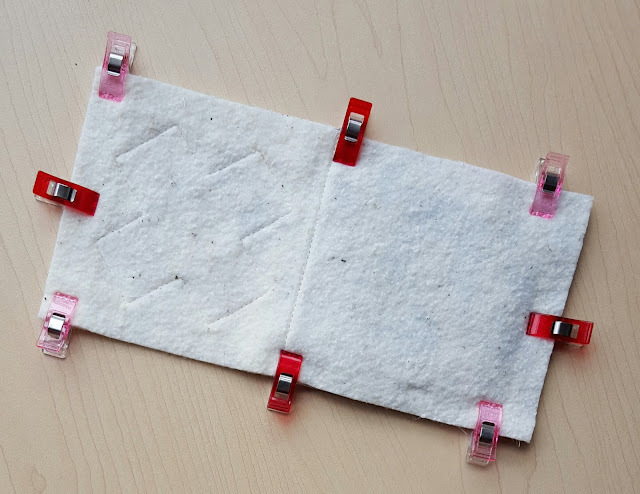 Carefully turn the book right side out through the opening on the short end, using a turning tool or chopstick to push the corners out, and give the book a good pressing with your iron. Tuck the edges back inside the opening, and topstitch 1/8" from the edge all the way around the outside of the book. 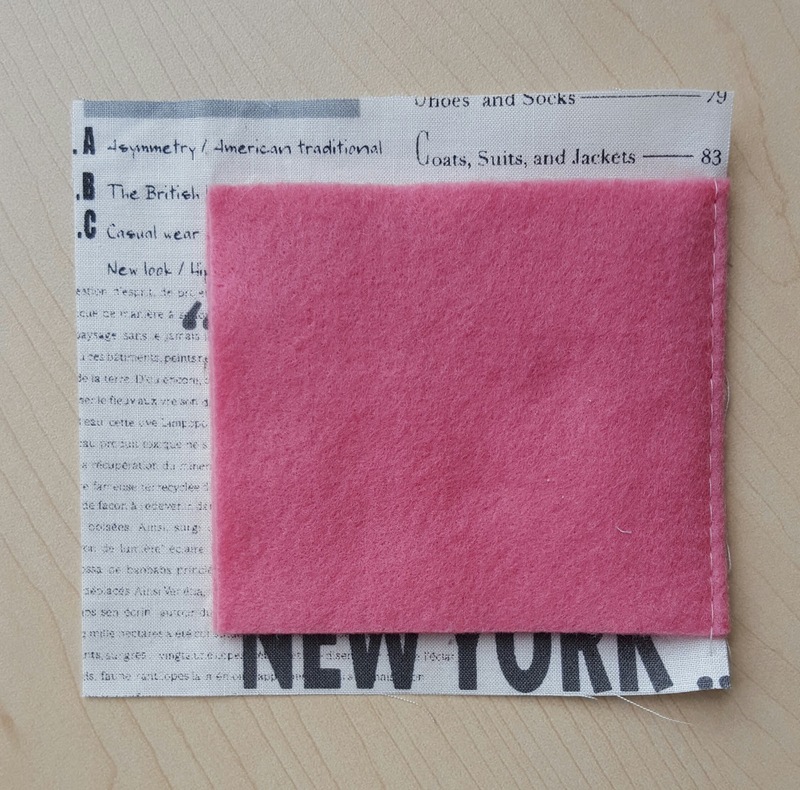 Be sure not to catch the felt pages in your stitching. Close the book and press carefully around the binding to help your book stay closed properly. 4. 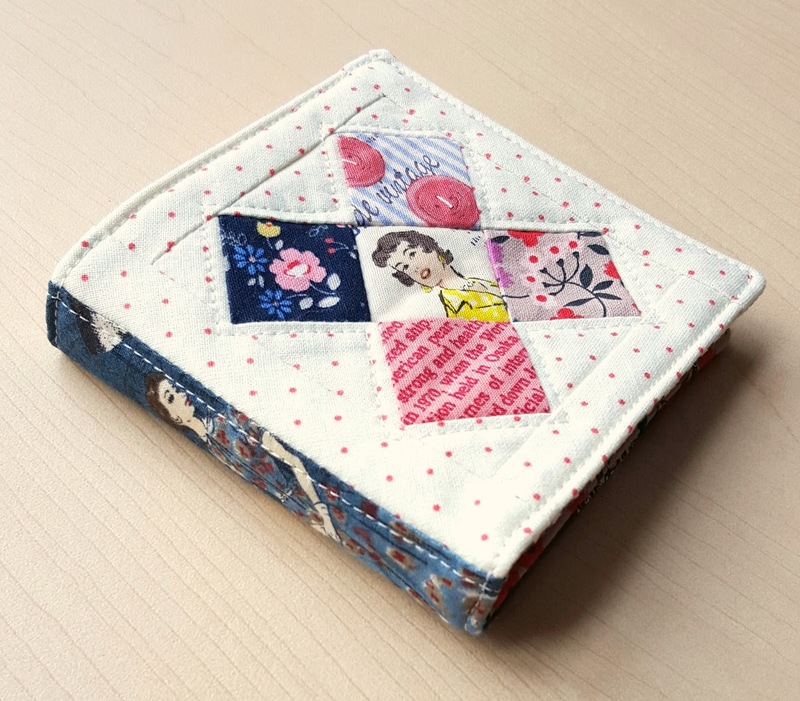 Fill the book with pins, needles, buttons, thread, and embroidery scissors.